This gift is the best way to surprise your love one and to make your moment more romantic and special. 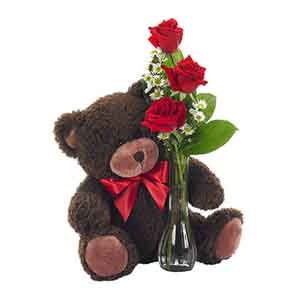 This romantic combination includes 3 long stemmed red roses in a keepsake vase and a cute soft toy that will help you to bring out her soft side, spreading love in the air. Available for delivery today or tomorrow by a local florist, it's the perfect bear and flowers gift package.